Lightroom Classic Tutorials > Organizing Photos > Folders on the Hard Drive > Lightroom thinks my photos are missing—how do I fix it? At some stage, most people run into worrying exclamation marks or question marks denoting missing files. These warnings appear when Lightroom can no longer find the photos at their last known location. But if Lightroom thinks my photos are missing—how do I fix it? Delete the photos or folders. Move the photos or folders. Rename the photos or folders. The external or network drive holding the photos is unplugged/disconnected. The drive letter has changed (Windows) or drive mount point has changed (Mac). You’ve moved to a new computer. How do I know that Lightroom can’t find my photos? Missing files are identified by a rectangular icon in the corner of the Grid thumbnail, with or without an exclamation mark. In earlier versions, it displayed a question mark icon instead. When you switch to the Develop module, the sliders are unavailable, as you can’t edit a photo that’s missing unless you’ve built smart previews. If the entire folder is missing, the folder name in the Folders panel goes gray with a question mark folder icon. If an entire drive is offline, the volume name in the Folders panel and the small rectangular icon on the left turn gray. If you have missing photos or folders, don’t be tempted to synchronize the folder or re-import the photos until you’ve explored every other possibility. 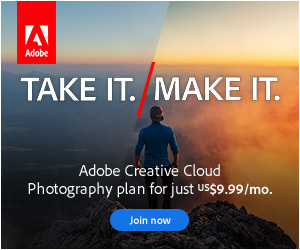 If you do so, you may lose the work you’ve done in Lightroom. How do I fix the missing files? If Lightroom tells you that files are missing, don’t panic. First, stop and work out the extent of the problem, and if you can, why it’s happened. Then fix it as soon as you can, using the instructions below, as problems tend to snowball if you ignore them. The quickest way to fix the missing files is to follow these instructions in order. If you start relinking missing photos before you relink missing folders and drives, you can create a bigger job. First, you must find the files on your hard drive. Lightroom can’t tell you where you’ve put the files if you’ve moved/renamed/deleted them using other software, so you first need to locate the missing files. Once you’ve found them on your hard drive using Explorer (Windows) / Finder (Mac), you can move on to step 2. If you get stuck, try using Windows Search or Mac Spotlight to search for one of the filenames. Look in the Folders panel. Is the whole drive offline, shown by dark gray text and a gray rectangle on the left? If the answer’s no, skip on to step 3. If the answer’s yes, why is the drive offline? Is it disconnected? If you’re on Windows, has the drive letter changed? If you’re on a Mac, has the drive name changed? If the drive is disconnected, plug it back in or reconnect to the network storage. Look in the Folders panel. Are some of the folders marked as missing, with gray text and a question mark on the folder icon? If the answer’s no, skip on to step 4. If the answer’s yes, why are the folders missing? Did you delete, rename or move a folder? If you deleted the folders, restore from the Recycle Bin/Trash or from a backup. If you renamed or moved the folder, you could move/rename it back and then redo the move/rename within Lightroom. If you set up the folders as a hierarchy using the instructions in my free Quick Start eBook or my main FAQ book (or this post), is a whole folder hierarchy of parent/child folders marked as missing? Or is it a single folder (or a few folders) that’s marked as missing? If it’s a whole folder hierarchy that’s missing, right-click on the parent folder (rather than the individual subfolders) and select Find Missing Folder from the context-sensitive menu, then navigate to the new location of that parent folder. As long as the names and structure of the subfolders haven’t changed, all of the subfolders are fixed at the same time. If it’s a single missing folder, right-click on the missing folder and select Find Missing Folder from the context-sensitive menu, then navigate to the new location of the folder. Lightroom then updates its records to the new location and the question marks disappear. If there are multiple missing folders, that aren’t in a folder hierarchy, do the same for each of these folders. Are individual photos still marked as missing, with an exclamation mark inside a rectangle on each of the thumbnail borders? If the answer’s no, your work is done. Go to Library menu > Find Missing Photos, just to double-check you haven’t missed any photos. If the answer’s yes, why are those photos missing? Do you remember moving or renaming them? Or deleting them? If you deleted them, you’ll need to restore the photos to their previous location from the Recycle Bin/Trash or from a recent backup. Remember, the photos are never IN Lightroom, and most of Lightroom’s tools won’t work without the original photos. (We’ll come back to worst case scenarios in a moment). If you moved the photos without renaming, you can either move them back, or you can link Lightroom’s records to the new location of the photos. To link Lightroom to the new name/location, click on the rectangle in the corner of the thumbnail. Lightroom displays the last known location of the photo. Click Locate and navigate to the new location of that photo. Check the Find nearby missing photos checkbox to allow Lightroom to try to automatically relink other files in the same folder. Lightroom updates its records to the new location and the rectangular icons disappear. If you renamed the photos outside of Lightroom, the quickest solution is to restore the photos with the old names from your backups and then redo the rename within Lightroom. If there are only a few photos, you can link Lightroom to the new name/location (using the previous instructions), however every renamed photo must be relinked individually. What if I can’t find the files? If you can’t find the original files, you’ll need to restore from backups. (And if you’re reading this before you’re confronted by missing files, please go and check your backups!) If you can’t restore from backups and the photos are recent, try using disk recovery software to recover the files from your memory cards. As a last resort, it may be possible to recover Lightroom’s previews if they’re available, but they’re only low quality JPEGs. I can’t stress the importance of backups strongly enough. Don’t delete the original files from your hard drive. Photos are not stored IN Lightroom. Move any files or folders within Lightroom’s own interface, simply by dragging and dropping around the Folders panel. Don’t “tidy up” using other software or the operating system (or if you do, fix Lightroom’s links immediately). Rename any files before importing into Lightroom, or use Lightroom to rename them. Whatever you do, don’t rename in other software once they’re imported. Don’t use Synchronize Folder to remove missing files and import them again at their new location as you’ll lose all of your Lightroom settings. Set Lightroom’s Folders panel to show the full folder hierarchy to a single root level folder. If a folder is moved from its previous location, or the drive letter changes, it can be fixed more easily than individual folders. 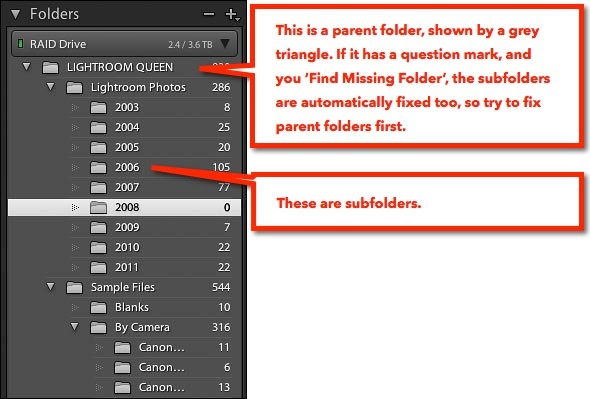 For additional information on fixing missing files, including what to do if it says “The file is associated with another photo in the catalog”, see the Missing Files section starting on page 435 of Adobe Lightroom Classic CC – The Missing FAQ or drop by the forum at www.lightroomforums.net. Hi Victoria, Happy New Year! Your articles are sooooo useful! This one reminds me that when I was updating my husband’s catalogue, before he moved (successfully, thanks to your articles) from Windows to Mac, when I syncd his master parent folder, on the Windows machine, it said there were something like 300 new images to import. But in the Import dialogue window, it found none. This was whether or not ‘Don’t import duplicates’ was ticked. I don’t understand this. Can you explain? Please. Hi Ruth! The most likely causes are either bug, or they could be the jpegs from raw+jpeg pairs. Okay I’ve followed the instructions and I really messed up my catalogs and folder hierarchy. Even though the hierarchy was by year e.g. : France 2012, France 2011, etc.. I have hundreds of images and individually re-linking will be a pain. What will happen if I delete the folder and then re-import? You’d lose the work you’ve done in Lightroom, so let’s take a step back. WHY were the photos marked as missing in the first place? And why is it wanting you to relink them individually instead of being able to relink entire folders, if you moved them outside of Lightroom? Relinking missing files or folders can’t mess up a catalog that wasn’t already a mess, so there’s more going on here. I think what happened is a mix up of the catalogs between the native LR and CC LR. There’s no differentiation in each icon on my Mac. Looks like I’ve got catalogs for the native, and catalogs for the CC version. Really dumb. I’d love to hire someone to get me organized. It’s a mess! LR CC and LR6 are identical – it’s just a difference in licensing and some new options are hidden in LR6 for legal reasons – so catalogs created in one can be opened in the other. I can help with live support ) but it sounds like you just need to figure out which catalog you want to continue using them or merge multiple catalogs if settings are spread over multiple catalogs – all the instructions you need are in my book (https://www.lightroomqueen.com/shop/adobe-lightroom-cc6-missing-faq/). Let’s do a session. Please email me your fee schedule. I’d really like to get this fixed. windows (“My Pictures”) and now almost all the catalog items in Lightroom have the question mark. The Lightroom catalog bears no resemblance to the catalog on my C Drive. I want Lightroom to reflect the organization on my C Drive. I guess I don’t really care if my previous Lightroom edits are lost–I can always re-do them. How do I make a wholesale change in the Lightroom catalog to make it match the “My Photos” catalog? Thanks! Oh boy, you do have a bit of a job on your hands. If you don’t care about your old edits, I’d just zip up your old catalog (in case you need to go back to it in future) and create a new one, then import the photos (set to Add at the top of the dialog). Thanks, but how the heck do I “zip up the old catalog” and “create a new one”? Your book is very helpful for most LR issues, but this situation is not addressed (user error). Zipping up the old catalog is simply a case of finding it in Windows, right-clicking and choosing Send To > Compressed Folder (http://windows.microsoft.com/en-gb/windows/compress-uncompress-files-zip-files#1TC=windows-7). If you’re not sure where your old catalog’s stored, open LR, go to Edit > Catalog Settings and it’ll tell you (page 482). Zipping it up just means you can’t open it by accident, and it takes up less space, but you could just move it to a backup folder if you prefer. Wow. I searched for missing photos and found that almost all of my nearly 60,000 photos are missing. I know why – I recently put a 2 TB SSD into my computer. I previously had a small SSD that held my Mac system and application files, plus a larger hard drive that held all documents, including the entire Lightroom photo library. The structure remains the same, except the path name now starts with a different root level drive name and a different user name. For some reason I can’t figure out, the Lightroom folders do not show a simple hierarchy as they should (and do in the finder), but instead provide a very long list of folders with no parent folder. Is there any simple way to fix this? To do it folder by folder would take FOREVER! Thank you so much for these tutorials. You mentioned resync would potentially lose all of the work done in Lightroom; is this that potential edits would be lost or that everything (starring/keywords etc) would be lost? Yes, you’d potentially lose everything, so it would definitely be a bad move. To fix the annoying habit that Windows has of allocating different drive letters, you can allocate a permanent drive letter, so it doesn’t matter which USB port you have it plugged into or how many devices you have on at that time. This will fix the path to your files. Thanks for sharing that link Kathleen. Is it possible to just start Lightroom all over from scratch, and how do I do it? Really hope you can help me out! Before you start a new catalogue, make sure you have a parent folder with all the other folders in it, rather than all your folder directly on the hard drive. I think this is essential for LR to be able to find everything. I hope Victoria agrees, if not, correct me please. I have messed up and changed the names and deleted the folders that used to be the export files, the one that lightroom found automatically when I was finished editing… I really need to go back to scratch with everything… Hard to be a newbie, so I don’t know what to do next. I have saved all the edited photos, so nothing will be lost. Would love to have a tip or two how to fix… Is there any way to start fresh? I have a slightly different problem. While my Lightroom catalog operates just fine (on my MacPro), for some reason the catalog structure has long been a bit odd. Most of the catalog’s folder is organized as you would expect – by year, then month, then day. But several of the photos long ago ended up in different folders, matching folder names I created within the catalog. Also, in some cases, there are extraneous “year” folders (with month and date sub-folders) in locations that seem quite random. Almost everything is inside the main Lightroom folder in the finder, with 4 of the extraneous “year” folders. at the same level as the Lightroom folder in the finder hierarchy. My question – is there any simple way to get everything organized into a more coherent and consistent structure, without losing any of the name-labeling and photo editing I have already done? Yes, putting all of the photos in a single folder hierarchy, rather than having them scattered all over the computer can definitely help with backups or moving to a new computer. Mark, you can drag and drop the photos and folders around the Folders panel to reorganize them. As long as you’re doing it in Lightroom, your metadata and edits are all retained. Victoria – All is well in the Lightroom folders panel. My concern is only with the mess within the Finder folder hierarchy. Or should I just not worry about that? Whatever happens in the Folders panel is also reflected on the hard drive, so they should match. Why not start a thread on http://www.lightroomforums.net and include screenshots so we can double check for you? Is there a way within Lightroom to look for all the files that are duplicates since I have messed up with some things imported a second time in different folders and I merged a LR catalog which I thought was all different photos but turned out to have some repeats. Yes, the Teekesselchen plug-in will do it. http://www.bungenstock.de/teekesselchen/ I’m working on a blog post explaining the process, currently scheduled for 22 May, so you don’t have long to wait. Whew… I had no idea why LR couldn’t find ANY of my folders. My situation/cause was not one listed. But, your solution was an easy fix. Thank you! Thank you! Thank you! Hi, Queen, I am using LR5.7 in a laptop (laptop x) which has only one C: drive. I store my photos in an external hard-disk which is recognised as E: Now, the laptop x is aging and prone to errors. I purchase a new laptop Y which has a different disk configuration: 256 SSD + 1 T hard disk. The SSD is partitioned into C: for program, D: for various drives and E: (the 1T hard disk) for data. Therefore the external hard disk cannot be have the letter E now. I am afraid that the saved catalogue will not be able to link with the photo containing external hard disk. Would you advise? That’s ok, you’ll just follow the instructions above to link the folders with the new drive letter. Easily done, honestly. I got it. Your instructions are just wonderful. Thank you very much. Hi Victoria, I was forced by my ISP to go to another provider and had to change my email address and forgot to inform you so have missed your newsletter for some time. it has probably been posted to my old address. Sorry about that. Hi Victor. Drop me an email with your old and new email addresses and I’ll fix your newsletter for you. Did you drag and drop the photos in Lightroom or in Finder/Explorer? In Lightroom should have been ok, but it sounds like you did it outside or Lightroom. Did you then reimport the photos at the new location, or are they just there with question marks? I can see you’re a Premium Member. Drop me an email with screenshots and details of what you did and we’ll figure it out. Hi Victoria, am in the process of upgrading to a new MB Pro and will email you soon regarding my keyword issues. Sorry took so long to reply but been away. Your blog has been so helpful as I moved Lightroom from my MacBook (which was slowly dying) to a new Mac. I do have about 3000 photos missing though. Most of my raw files have been saved over three external hard drives. It isn’t picking up any photos from two of the hard drives. Do I need to save the catalogue on all hard drives? And then open the catalogue for each drive? Also some of the raw files were accidentally saved on to the old Mac. I have now transferred these to my main hard drive but when I try to select ‘find the missing folder’ and navigate to where the photos are now located it doesn’t work. No images appear. Thank you so much for any help you can offer. I was wondering if you have any thoughts on this – I always add a new batch of photos from my DSLR into a new sub-folder under my main LR Photos folder ( on my mac) and run “Synchronize Folder” from within LR. It has worked fine until recently. The Synchronize option is now finding some missing photos ( which it asks to remove by default). When I choose “Show Missing Photos” after I run the “Synchronize Folder” option, it creates a temporary collection of those photos (which LR thinks are missing), but now upon running Library->Find Missing Photos, it concludes there are NO missing photos and REMOVES that temporary collection. When I go and try to Synchronize my folder again, it again finds the same missing photos (and I can either choose to remove them or have LR show them to me via a temporary collection….). How do I fix this? This keeps happening whenever I try to synchronize my main LR photos folder. These falsely missing photos are NOT from the new sub folders I am trying to bring in. They are from previously added sub-folders. Its the same photos again and again. As far as I remember, I have not moved photos around outside LR. The photos do get located through Show in Finder as well. My best guess would be a difference in capitalization, but post it at the Official Feature Request/Bug Report Forum at https://feedback.photoshop.com/photoshop_family/topics/new/add_details?topic%5B so the engineers can take a look. Hi Victoria, I’ve discussed this with Adobe once on the phone, and they were baffled. Lightroom THINKS I’m missing photos which are exactly where they are supposed to be on my drive! I no longer automatically remove missing photos. I check quite a few of them and IGNORE the message I get when I’m syncing. New problem: keeps thinking I need to import photos which are imported. Tells me I have # to import when syncing. Then when I tell it to sync, it tells me no photos to import. Repeatedly. When I change the name of the file, it imports! Then I change it back. SMH. The false missing photos issue started at least a couple years ago. The syncing issue of photos already correctly in the catalog started this weekend. I moved to a new iMac and most recent Classic CC. I always use the most recent version of LR, since v3. I know how LR works. I understand databases. I know if I move files around on the desktop, usually when adding clip art, I need to re-sync again. I sync once usually just to see the images. I rename folders based on contents. So much faster via desktop than LR. THIS is how I organize my files. I can’t be limited to only moving and renaming within LR cos it’s soooo slow! But I know to re-sync. What doesn’t work is whether I move files within LR or outside of it, LR repeatedly indicate missing or need to import/sync files which are correctly imported. Really slows down my workflow! No longer can I mindlessly remove so called “missing” files. I wish instead of all those extra modules — does anyone use Print, Web, Slideshow, etc when we have so many other programs doing that and better? — they would improve the Library functions. Basic features we use repeatedly. Oh well. Happy New Year! Hope 2018 is great for everyone! My best guess is your folder path has changed capital letters somewhere at some stage. It most frequently happens when moving computers. Post it on the forum with some screenshots of your Folders panel and we’ll help you figure it out. I have migrated LR5 to a new computer and am trying to re-link all of my photos from my LR catalog to the external hard drive where they are stored from a backup. My photo hierarchy is the year (2017) and the subfolders are the dates the photos were taken. I already relinked three subfolders to the external hard drive and now, I realize that I should have selected the parent folder. Now when I try to right click on the parent folder and relink properly, I am getting a message “The selected folder or one of its subfolders is already in LR. Do you want to combine these folders?” My options are to cancel or select ‘merge’. If I select merge, will it combine all of the images in the individual subfolders into one big folder (which I don’t want) or will it only combine or merge the images in the three folders that I have already re-linked? It’s fine to say merge in that case. It’ll slip the existing 3 folders back into the folder hierarchy where they should be. Victoria – Your article is very helpful. I just upgraded to a new windows 10 computer. Prior computer was a Mac with 3 internal drives and a drobo attached. Approximately 300,000 photos. All drives were copied over to a single drive on the Windows computer. The old Mac drive name was replaced by that drive being put in a folder with the same name. For example Macintosh HD drive on the Mac became a folder named Macintosh HD on the windows E drive. All other Mac drive the same thing was done. Unfortunately I did not read your article prior to copying the files over. Should I start over by reorganizing all the files on the Mac under one file folder making sure they are linked in Lightroom and redo the export or is there another solution? The export took several days and if there is an easier solution that would be very helpful. Thank you in advance. I’ve replied to your email Larry. It sounds like an easy enough fix, so don’t start over. I have 2 computers – my main editing computer (Windows) with the LR catalog stored on a 4 disk eSATA raid array connected to it. I also have a MacBook Air which I want to use for editing on the go. Will there be compatibility issues with the MacBook accessing the windows created catalog or with syncing files back to the main catalog from the Mac? I’m having new and unexpected issues with Lightroom Classic. On my mac, I keep all of my photos on an external USB 3 drive. The catalog is on the mac in my library. This setup has always worked fine. Suddenly, the last couple of times I’ve plugged in the external drive and launched Lightroom, the library in Lightroom shows everything with question marks. The hard drive, which is named “Lightroom A” is seen in the Folders list as “Lightroom A2”. When I select a folder with the question mark and use find missing folder, and point to the folder on the external hard drive, my “Lightroom A” folder appears in the list and those files are moved to that folder in the list. I have to repeat this with al of the main folders. Once everything is back the way it should be, the “Lightroom A2” folder disappears. Is there a fix/explanation for this weird behavior? Thanks so much for any help you can provide! Lightroom A2 or Lightroom A-2? The latter sounds like the OS is changing the mount point. Could have been A-2….I’m wondering if connecting the external drive into a different USB port than last time could possibly be the issue. I’d think on a mac this would not make a difference, but who knows? Thank you for your help! Thanks so much – I enjoy your newsletter and website! I might need to see a screenshot or two to figure out that mystery. I’d guess a difference in capitalization somewhere perhaps, or a drive letter changed. Which OS? Post the screenshots and description of the problem on the forum and we’ll help you figure it out. Continuing to edit probably just means you have smart previews for those photos. Uh oh, getting problems. I’m migrating from a mac to a PC. I have three issues with reconnecting in the hierarchy. First issue: I try to reconnect the hierarcy that’s on a missing drive (because it’s all on a new drive as well as new computer), but when I reconnect one, the other folders all just vanish without being reconnected. That whole “missing drive”dissapears. So I’m left unable to reconnect more than jst one folder. Third issue: I don’t seem to have the same right-click options on my drives on my new Lightroom PC, i.e no hide/show parent folders. But only to active drives, i.e the missing drives I can still do that on. Very weird. I didn’t expect this to be easy, but I didn’t expect it to be this much of a nightmare. Currently I can’t get my files working . I found a solution, tricky, but it worked. I had to reconnect everything before starting the migration process, and adding parent folders that went all the way back to the root. I hope this gets easier in future. Well done Jonathan. I’m not sure why you were having trouble, but now you have a hierarchy set up, any future moves should be simple. Forgive me if this has been asked above… lots of comments, but here’s my deal. It happened to me once and I thought it was just a one -time thing, but it just happened to me again. I shoot on a d700 and a d750. One has a CF card, the other SD card. (don’t think this has anything to do with it but just including in case). When I upload one, I make a folder for it, then upload the other as it’s the same shoot. I leave all my images on the cards as I had a computer crash on me years ago and will never make that mistake again. All of a sudden when I go to edit, I notice that all the images from one card are lost. I try to re-download the card, and lightroom recognizes them at first, but then they all dispear. But I KNOW they are on the card. What gives? As in, you can see them in Lightroom but when you go to Develop, it says they’re missing? > I try to re-download the card, and lightroom recognizes them at first, but then they all dispear. The import dialog won’t show them if the records are already in the catalog. From what you’ve said so far, I’d bet you’ve got it set to ADD at the top of the import dialog, so it’s just adding them to the catalog but without copying them to the hard drive, so when you eject the card, Lightroom can’t find them any more. What you need to do is select COPY at the top of the import dialog, and let Lightroom copy the photos to the hard drive so they’re still available when you eject the card. Just wanted to say thank you for this article! My Mac crashed and I bought a PC as replacement. I had to use this information to reconnect my photos to my catalog. Thank you! Help! I’ve looked through most of the comments and I can’t find a solution. It shows that I can’t import photos into lightroom because they are already there but the folder says 0. I’ve already edited half of the folder (300+) and don’t want to do it again. How do I find my pictures? The folder says 0? Could they be in another folder? I’d switch to All Photos view and scroll to that date. Hi, being a newbie I’m not sure if this is where I say thanks. But THANK YOU Johan Elzenga for a rapid response to my first question and my 70K or image files are now slowly going home. I’ll make sure he sees it! I have 24,000 photos on Lightroom 6 on an external drive on my original Toshiba laptop. I bought a HP laptop this weekend and I called Adobe Customer Support to help me download Lightroom 6. This lady did something to my database and when I hook up the external drive to my HP I get 23,000 photos but they are all listed as missing and I can’t see any of the folders. When I attach the same external drive to my Toshiba I can see all of the photos and folders. How can I resolve this issue?? Victoria, someone previously asked for a fee schedule. I would gladly pay you to fix my problem. Have you tried following the instructions above Steve? You need to tell Lightroom where the photos are now. The drive letter is probably different in Windows on each laptop. Victoria, I don’t see any “instructions above”. Please repeat the instructions. Thanks Paul, I get 23,000 photos but they are all listed as missing and I can’t see any of the folders. Victoria, I also have a backup of all my Lightroom pictures. I copied Backup Lightroom (F:)>LIGHTROOM>LR4 Pictures>2006 (this is an example of all)>2006-05-28 Cuprum (this is an example of all). When I click on 2006-05-28 Cuprum I see 53 pictures. That’s great that you have a backup. You mentioned that you can’t see any folders, so let’s start there. Make sure you’re in the Library module and go to Window menu > Panels > Folders. Then you should be able to see the folders in the Folders panel and follow the instructions further up this page to connect them with the new location. If you’re still stuck at that point, visit the forum (in the menubar) and create a thread with screenshots of what you can see so we can give you really specific instructions. Victoria, When I attach the external drive to my HP Laptop I see “All Photographs 24,500” under Catalog including keywords. I click on Catalog and see 24,431 photos but no list folders. I right click on All Photographs and get 1) Import Photos and Video and 2) Import from another catalog. It still sounds like your Folders panel is hidden Steve, but we’ll go in circles until you show us screenshots. Victoria, Thanks so much!!! That was the problem and I have access to all of my photos. Out of curiosity, where are you now? Your reply is dated 2/23/2019 at 10:03 PM, much later than it is in Boise, Idaho. We’re based in the UK, but the time stamps on the site are a bit wonky at the moment. We’re doing a big website upgrade shortly that should fix it. Hi Victoria, I hate to keep bothering you, you are going to think I’m stupid! I invoke LR and see 23,409 photos but all are missing and I can’t see any folders. I did exactly as you told me; make sure I am in the Library module and go Window menu>Panels>Folders. You say I should see the folders in the Folders panel (I don’t) and follow the instructions further up this page to connect them with the new location. I never could find any instructions further up the page so can you please repeat the instructions? Steve, this entire page is about fixing missing photos. Scroll to the top to start reading. If you need further specific instructions, post on the forum and include screenshots, as were just going in circles at the moment. Thanks for your message Steve, and sorry to hear of your predicament. I’ve deleted the messages as requested. A suggestion… have a look at Lightroom CC rather than Lightroom Classic. It’s a simpler interface without the complexities of file management. If you post screenshots on the forum, we can help solve your missing files and help you migrate to CC, but we’re working blind here. Thanks again for all the help Victoria but I’m done with Lightroom Classic and CC. Too much stress for me. I have salvaged all of my photos on a hard drive so at least I can look at them thanks to my backup! Right, I am on a good path! Never change anything outside of LR… I am the lighting example. This is old stuff. After I got my drobo I have become far more organised… Still, this is a pain!